Soft tissue trauma initiates an inﬂammatory response that increases the local tissue temperature. Protection, rest, ice, compression, and elevation (PRICE) therapy is a widely accepted approach to treatment of soft tissue trauma, which modiﬁes the inﬂammatory response. 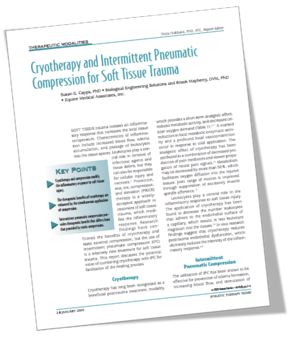 Research findings have confirmed the benefits of cryotherapy and static external compression, but the use of intermittent pneumatic compression (IPC) is a relatively new treatment for soft tissue trauma. This report discusses the potential value of combining cryotherapy with IPC for facilitation of the healing process.